This post is going to focus on the basics of tastefully making use of lead phrases in-between rhythm playing in a blues situation. Although this exercise is arguably quite sterile, it’s going to be an invaluable first step to get you more comfortable with the concept. Once you’re familiar with it you’ll be allowed much more freedom with your playing. Below is the structure for what we’ll be playing. This relies on a good knowledge of the 12-bar blues in E, (here’s a link to that lesson), the difference, as you can see below, is that every alternate bar is room for you to solo. In the final bar, however, we’re not going to solo because the turnaround is quite interesting already. 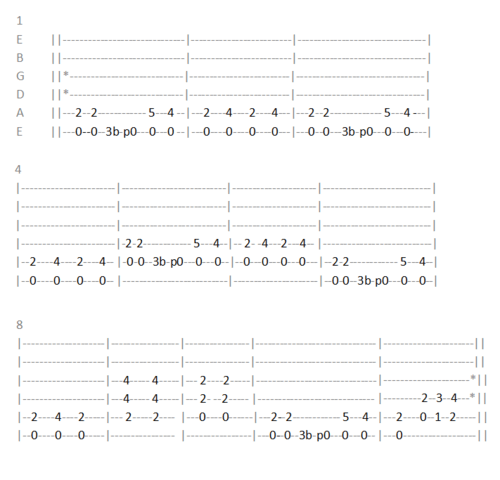 The placeholder lick I’m going to demonstrate this with is the following. There’s no reason you have to learn this phrase, if you have your own arsenal of blues or blues-rock licks in the key of E they will do the job just fine. I would suggest, however, if you’re not going to use this to try and use something in the open position, as it will be easier to play that rather than jumping up to the 12th fret for a bar. Here we go! The backing tracks below are longer versions of what I played over in the video, with a piano as well so it’s a little more obvious when the chord changes happen. If you have your own blues licks, use them. Even better, move them around the fretboard to accommodate for each chord. As in, when the rhythm is playing an E, play the lick in E, when they move to A, move the lick to A as well. This is called chord-tone soloing and is the secret weapon of many blues greats, (it’s a pretty big deal in jazz too). These are the kind of licks you’d get from a blues-rock band, or perhaps in a melodic moment from someone much heavier. Good technique and knowledge of string bending, finger-rolling, and one note per string style licks is advisable, so maybe refresh your memory of these if you’re unsure. In almost all of these cases you’re bending the notes a full step up. Be aware that I’m going into far more detail than perhaps is necessary, feel free to just go by what you see and hear in the vide. The first phrase in Lick #1 is really common amongst blues and rock players, and I confess that I lean on this much more than any other. Start by bending the 12th fret on your G string, and it should reach the same pitch as the note you then play on the 10th fret for the B string. I use a rolling technique to reach the next note as they are on the same fret. Then play the 13th fret on your B string, pulling-off to the 10th. Then play the 13th fret again, this time bending quite quickly, (the sudden nature of this bend means that you don’t need to be so accurate). Bend that same note again, this time vibrating when you reach the intended pitch. The “r” indicates a return to the original, un-bent note. Pull off from the 13th fret to the 10th, and then fret the 13th fret again, followed by a vibrato on the 10th fret. Now, on the G string, pull-off from the 12th fret to the 10th, then perform a half-bend on the 12th fret, (with no particular target-note in mind), and pull-off to the 10th fret again. Lastly, play the 12th fret on your D string, then the 10th fret, and vibrato on the 12th to finish. This one involved a repeated phrase, so out of simplicity I’ve written that the first part is to be repeated twice, (so played three times in all). Firstly, bend on the 13th fret of your B string to reach the same pitch as the 10th fret on the high E, which you then play. Now play the 13th fret on the B again, followed by the 10th fret on the same string. Now bend the 12th fret of the G string to reach the pitch you just played. Play the 10th fret on the B, then the 13th, and the 10th again. Play all of this another two times. Start the final part as we did the others by bending the 13th fret of the B string, then playing the 10th on the E. Then play the 13th fret on the B string, then the 10th. This time, bend the 13th fret of the high E string up a full-step, and return it with some vibrato. In this lesson I will add-on to the shuffle pattern learnt in 12 bar Blues #1, making it slightly more complex, but much more interesting to hear and play. I will also introduce the idea of the ‘blue note’ and the turnaround. The I, IV, V pattern is the same here as it was in the previous lesson, so the chords and the order haven’t changed. I’ll go through this pattern bar-by-bar. Please watch the video clip to get a good idea of how everything should sound. Bar 1 demonstrates most of the changes made to this pattern. We start by strumming the open E5 powerchord twice, then use your 3rd finger to fret the 3rd fret of the E string, bending it slightly when you pick it. Then release the string, pulling-off to the open E. Then, stretch your 4th finger to reach the 5th fret, and then the 4th fret. Mute both of these note pairs right after playing them to give a nice rhythmic heaviness. Bar 2 is the same as you played for E in the first 12bar lesson. Bars 3 and 4 are the same as 1 and 2. Bars 5 and 6 are the same again, except that you are now on the A string. Bars 7 and 8 are the same as 1 and 2, although you can leave the 3rd chord in bar 8 ringing over the 4th, which will add some nice variation. In bar 9, you are playing a B5 chord twice, the first one being staccato. I’ve removed the shuffle for this part so as to add some variation to the pattern. These last bars are what are commonly referred to as the ‘turnaround’ in blues music, and it’s the part that is most commonly tinkered with. Bar 10 is similar, but you are playing an A5 instead. Bar 11 uses the same pattern as bar 1. Bar 12 starts with an E5, and then we get this chromatic walking part. To fret the A5, I use my third finger on the 2nd fret of the D string. I then use my first finger to fret the 1st fret of the A string. This Bb is the blue note, which is commonly employed as a pleasant and chromatic nuance in blues music. My fourth finger is playing the 3rd fret of the D string, which is the 5th in this powerchord. I then shift both these fingers up half a step to play the B5. If you haven’t encountered the dots at the end of these bars, it simply means to repeat from where you last saw the dots – in this case, the beginning, which is exactly what I do in the video. For the first part of this lesson you must be sure you can play the chords E, A and B, (all Maj), fluidly, with minimal time spent working positions out. You will also need relatively good timing, although I’ve kept it straight-forward for now. The I, IV, V pattern is the most commonly employed set of chords in blues music, (perhaps every genre! ), and has many alternate versions and substitutes. It is commonly referred to as “the 12 bar blues”, because it takes up exactly that many bars. Here we’re going to examine the simplest form of this pattern in the key of E. You will almost definitely need the help of a metronome for this lesson, as timing is key. Play the chords below at a steady pace, along with the video if you like, strumming each chord 4 times per bar, (crotchets). The dots next to the double-lines at either side are repeat marks, which mean that you should start again from the last place you saw the dots, (in this case, the beginning). Once you are comfortable with this pattern we can try using the traditional blues shuffle riff. The second part of the video demonstrates how the E shuffle should sound – you’re still strumming 4 times every bar, (as indicated by the crotchets above the notes in the tablature), with every other strum being staccato, (lit. ‘detached’, play the notes then mute them with either hand, so they don’t resonate as long as the others. This is indicated by the dot just below these notes in the tab). I’ve only written one bar for each shuffle, largely for the sake of space, and my own sanity, but it should be clear that you need to play these in the same order as the open chords. (If in doubt, play along with the video).